This white paper addresses technical professionals who want to increase the efficiency and flexibility of their data center and are considering deployment of private cloud or delivery of IT as a service (ITaaS). Transforming the data center is a journey with predictable IT challenges along the way. This white paper summarizes what Cisco has learned from the transformation of our own data center and the experiences of our customers, and reviews the technology requirements of each stage along the journey. 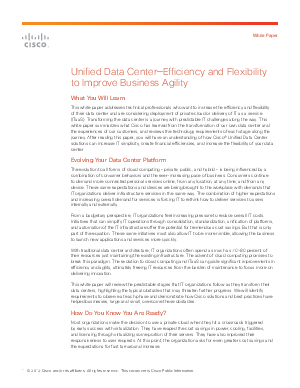 After reading this paper, you will have an understanding of how Cisco® Unified Data Center solutions can increase IT simplicity, create financial efficiencies, and increase the flexibility of your data center.